The Clad Life’s Diamond Mahone, Mi Golondrina’s Cristina Lynch, and more on how their personal style diverges from and is undeniably influenced by their mother. 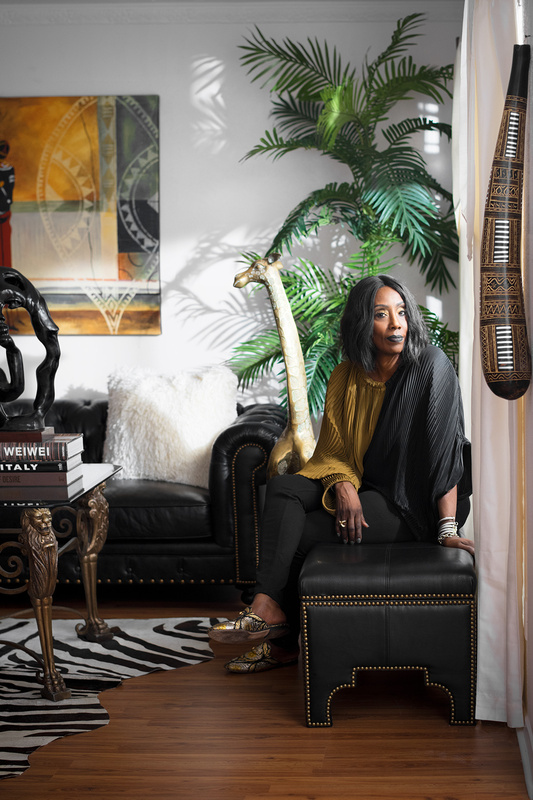 Diamond Mahone and Claudia Coleman infuse their homes with an arrangement of pieces that have been thoughtfully collected and intermixed with items from generations of family. 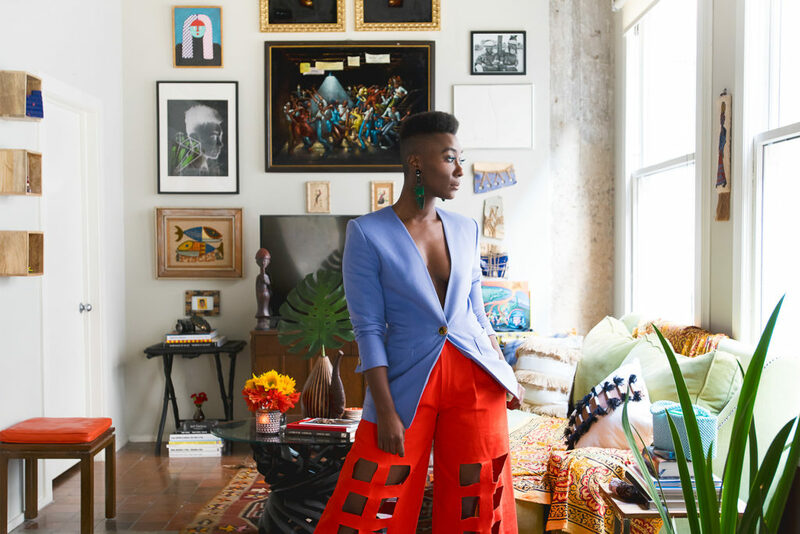 Diamond, a stylist and creative director at The Clad Life collective, has a keen eye for fashion that’s reflected in her sanctuary. Claudia, also a stylist, takes a similar tack but uses her travels as the foundation for her interiors. Unsurprisingly, there’s a lot of inspiration overlap. Claudia Coleman’s house is layered with curated finds from her travels. Do you see any of your influences in Diamond’s home? Oh, yes. I downsized, so she has many items I’ve given to her. Some were inherited from my brother, and others are from my father that were purchased in Africa. Has she influenced you? I get Diamond’s style, and she knows I’m a little more conservative than she is. But when I was updating, we went shopping because I wanted something a little edgier, and she has style that I love. What’s the main thing you collect? Giraffes. I’ve loved them since I was a child, and people have always given them to me. Maybe because I’m tall? And all of them have names. How would you describe your home? Elegant European chic with a twist. It’s the same as fashion—I outfit my home as if it were something that I’m wearing. The foundation is black, and I accessorize around it. Old World mixes with modern, but ultimately, it has to be comfortable and inviting on every level. her downtown apartment. Much like her personal style, her space is decorated with unexpected pairings and colors. Have you picked up decorating tips from your mom? Absolutely! My additions of African and black art definitely come from my mom, including my uncle’s iconic Ernie Barnes images he had re-created on black velvet while stationed in Vietnam. She’s also given me some amazing statues and a pair of Tibetan dresses that hang above my bed. All of it adds sentimental value. When did collecting become a focus? In the last four years. Through traveling and visiting other homes, I realized I have a specific style and wanted to incorporate that into my space. Fashion is one thing, but having your home reflect that is important, too. What’s one piece of advice from your mom? Always make sure your bed is made. She’s right. It makes a world of difference. 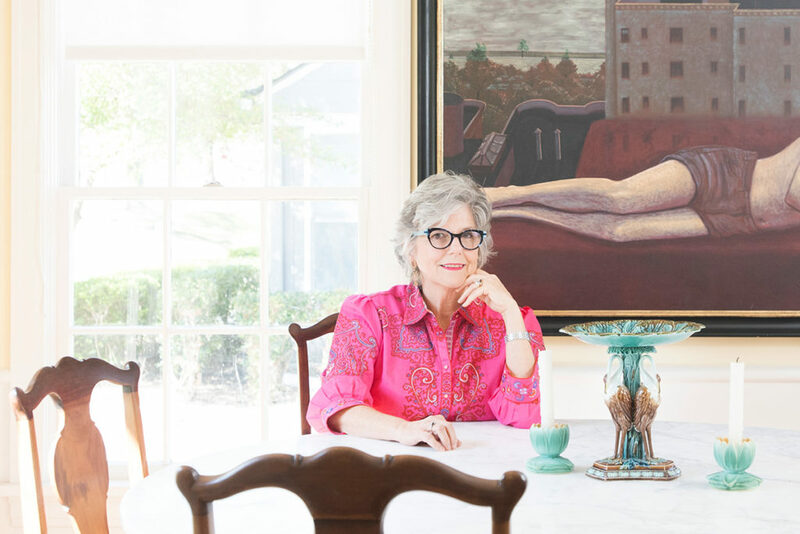 Growing up with a mother who is an art collector and philanthropist, it’s no surprise that Meghan Looney’s clean-lined home is filled with contemporary pieces and architectural details. Designer Rob Dailey helped her curate a space that nods to her mother’s influence while also taking into account her own style, which she honed as director of branding and communications for Forty Five Ten and now as a marketing consultant. 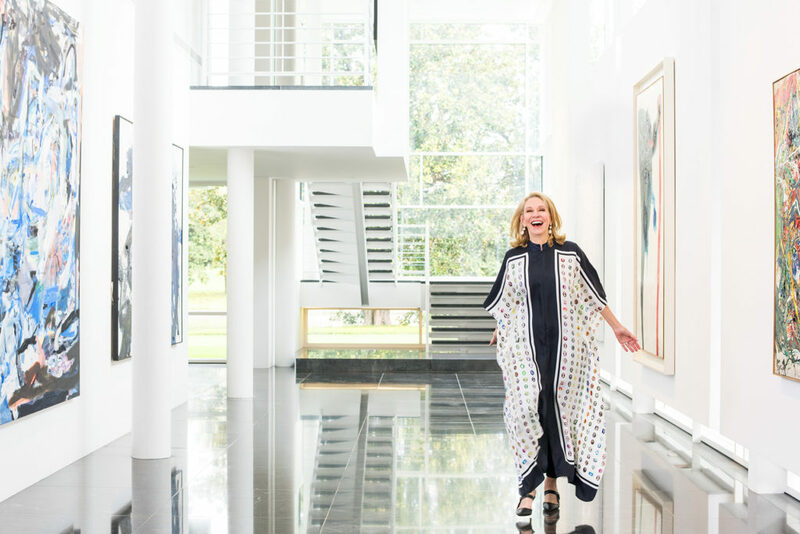 The ever-gracious host, Cindy has opened up the doors to her Richard Meier–designed home to countless nonprofits and art enthusiasts—inspiring more than just her children to live amongst art and good design. Do you see your influence in your daughter’s design? Yes, I think her home has a sophisticated edge to it. She has a great sense of color all her own, but she still uses soft fabrications similar to my sensibility. She has a livable mixture of contemporary and vintage furnishings, art, and accessories that reflect her personality. What did you learn from your own mother about design and how to live in your home? I grew up in the ’60s and don’t care to revisit that era of design. Turquoise carpet is not OK! Did you pass anything from your home on to your daughter? More than I would like to have given to both my children. Meghan now lives with my favorite Kagan sofa and several Plattner pieces from a dear friend of ours. Of course, her walls are filled with art from our collection. We try to buy something for each of our two children so they can begin their own collections. 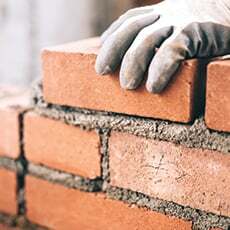 What’s one thing every home should have? Good wine, a great playlist, and friends around your dining table. Meghan Looney called on Rob Dailey to help her find an individual style that meshes with modern pieces given to her by her mother. How did your mom influence your home’s style? We grew up with leather and very little color, so I knew I wanted the opposite: still minimal but brighter and softer. I gravitate toward the same clean lines you find in my parents’ home, but comfort is important, too. Our styles are usually complementary, but at the same time, if I choose something my mom doesn’t care for, she definitely lets me know. What did your mom teach you about how to live in your home? Few do the art of entertaining like Cindy Rachofsky—a comfortable guest room, fresh flowers, and lovely amenities are just a few key details to remember. What is one thing every home should have? One can never have enough candles, books, flowers, and framed photographs. Did you look to your mom’s advice when you started designing your space? I look to my mom for advice on almost everything—probably more than she would like. Her style is like no other. She has a classic sensibility but isn’t afraid to take risks in both her home and clothing. She is effortlessly chic, and it never ceases to amaze me. Often you can see it coming: a parental influence on the interior design tastes of their children. Sometimes their aesthetics take you by surprise—like with these two. Susie Phillips and Dan Phillips are both creatively accomplished—her collages and paintings have long been found at the Conduit Gallery. And Dan? He’s on the Webb Gallery roster and regularly on the walls, is a classically schooled furniture designer, and fronts True Widow, a band with a sound that melds shoegaze and stoner rock. In their surroundings, artfully collected vignettes offer spaces for the eye to wander. Artist Susie Phillips frequents flea markets to achieve her eclectic style. She often took Dan along with her to shop when he was a child. Did your mother influence your taste for design? In a roundabout way, because I was more influenced by my grandmother, and she, of course, influenced my mother. My grandmother was a collector, and a lot of my most precious treasures were hers. She lived in a traditional setting that was very nurturing and comforting. That’s what I have unconsciously strived for as I have acquired over the years. What’s it like stepping into your home? It’s eclectic and comfortable. It looks like a person with a flea-market addiction lives here. For example, my coffee table—not the one Dan made me—is an old window from India. On top of it is an Arts and Crafts candelabra, a stack of art books, and several leaf-shaped bowls from different eras. Do you have many pieces designed by Dan? I do, but it’s hard to get him to make me anything. I have the coffee table and an exquisite card table that unfolds with interesting mechanisms. I play mediocre bridge with friends but we’ve never used it—it’s too pretty. Even though his furniture has a foundation in tradition, there are flourishes that are uniquely Dan. Dan Phillips rests on a piece of furniture he designed. 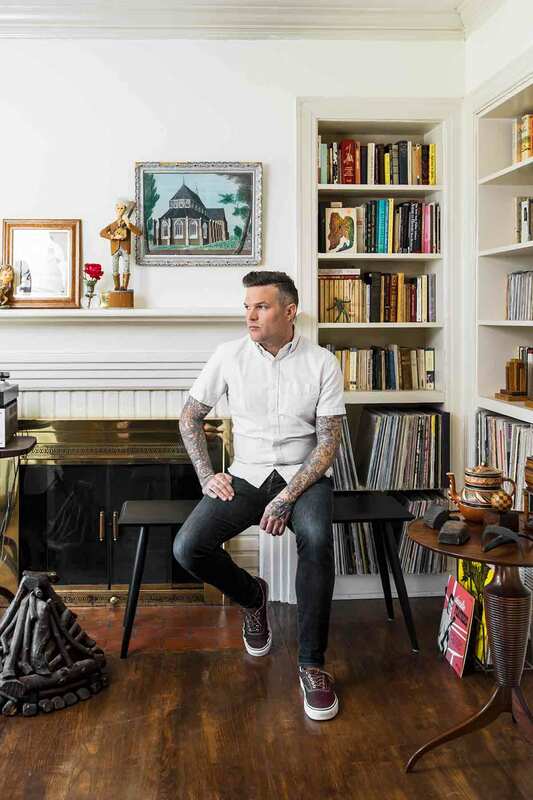 The artist and musician fills his home with curiosities, a passion he shares with his mother. What’s your home filled with? Offbeat antiques. Folk art. Paintings. Tramp-art boxes. I’ve got a couple of glass-front bookcases filled with trinkets; Mourning Art hair; old tools that aren’t at the shop; and books on furniture, decorative art, and art history. Most every piece of art in my house is some sort of portrait. And in terms of furniture, there are a few pieces of contemporary mixed with pieces I’ve made—like my bed, side table, blanket chest, and a bench. But most everything has been picked up at antique fairs or flea markets. You’ve inherited your mom’s style? My mother has been taking me to flea markets and antique shows since I was in a stroller. I grew up in a house that’s pretty much decorated the same way—with a ton of antiques, art, and trinkets. I think I’ve just kept it going because that’s what feels comfortable to me and is how my eye was trained. I’d like to say I got into it all on my own, but I don’t think that’s realistic. I think it has everything to do with growing up in that house and going to all those antique shows with her even though I hated it as a kid. At some point I crossed over, and I’d meet up with my mom and wander around for hours. What’s the most treasured piece in your house? I’d say a sculpture of a cowboy with a guitar that my mom gave me when I was 13. I’ve had that front and center in every house I have ever had. This mother-daughter duo’s aesthetic builds on generations of family. Mom Cristina Barboglio Lynch hails from Torreón in the state of Coahuila, and she and her sister Jan Barboglio are known for their creativity—Jan designs an eponymous decor line; together, they created a successful white peasant dress collection. Cristina Lynch followed in her mother’s footsteps as a designer. After her time working for Oscar de la Rentain New York City, she moved back to Dallas and created Mi Golondrina, a fashion-forward embroidered clothing line made by artisans in Oaxaca, Mexico. Her West Village apartment represents a more modern approach to her mother’s design while still honoring the craftsmanship and heritage of Mexico. 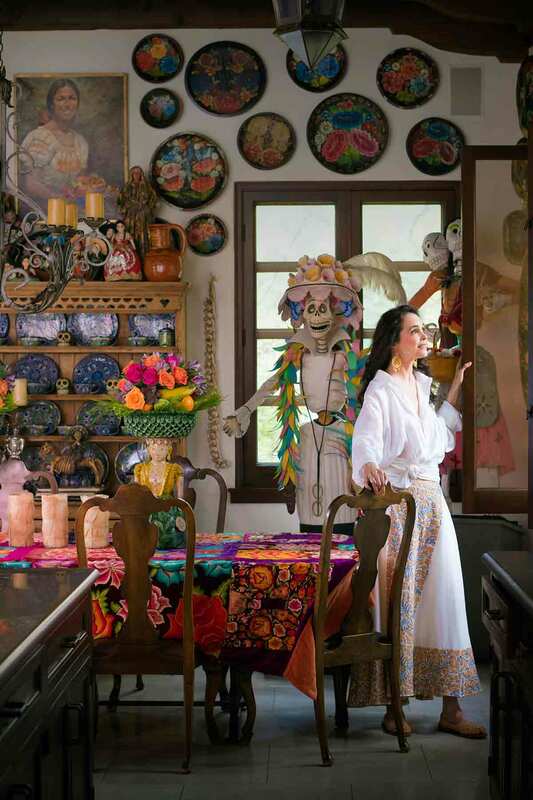 Cristina Barboglio Lynch’s Preston Hollow abode, also designed by Dan Nelson, is full of Mexican-inspired treasures. Does your daughter influence your home’s style? Working with Cristina has been the most fun way to continue exploring Mexico and discover a broader range of artisan work. I have traveled all over Mexico my entire life looking for great artists, but this has given that search a new purpose. What did you learn from your own mother about design and how to live in your home? My mother loved to entertain and throw parties. She was known for it her entire life. Her home was always warm and inviting. She gave life to the art. That’s what I love most. I remember the stories every artist tells me, because storytelling is art as well. Do you look to your daughter for design tips? Of course! While I would like to say I influenced her in her early years (what mother wouldn’t), Cristina has developed her own fantastic style. She can combine her New York City–inspired fashion sense with what I love about Mexico, and it’s a blast to come up with new styles together. What is one thing every home should have? Our home has been filled with Mexican artists’ work and their stories. Every home should share its version of an expression of art. And every home should be filled with love and peace. And of course, with fiestas! Clothing designer Cristina Lynch wears a piece from her Mi Golondrina collection. With the help of designer Dan Nelson, she mixes clean lines with ceramics from Mexico. How did your mom influence your home’s style? My mom has a deep appreciation for artists and their work. I grew up meeting artists in Mexico who made beautiful ceramics. It makes me so happy to be able to visit them now and collect pieces by these artisans and their children. I have a ceramics piece in the shape of an old telephone made by the daughter of Jose Garcia Antonio that sits on my bedside table. I cherish it. I have always admired Jose Garcia because despite having lost his sight, he never stops creating beautiful work, and now he has passed that on to his daughter. What did your mom teach you about how to live in your home? My mom loves adding details that make a space feel extra special when she entertains. She is always lending me intricate, hand-embroidered Otomi tablecloths. She also taught me that a home can never have too much candlelight and fresh flowers. When I have friends over, I try lighting as many candles as possible and enjoy creating floral arrangements. Do you have anything in your home that was your mom’s? My mom is so generous and has given me gorgeous works of art. My favorite piece was a Christmas present from my parents last year. It is a print called “Hand and Spur” by Laura Wilson. I love looking at it because it reminds me of my grandfather’s ranch in Mexico. What was your mom’s greatest piece of advice? My mom taught me that great design does not have to be expensive. I have been collecting green ceramics from the Oaxaca market that I can’t wait to display in an antique wood cupboard.